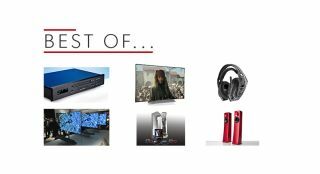 Best of the Week: Sky and Devialet join forces, LG OLED TV review, Apple kills off the iPod Nano and Shuffle | What Hi-Fi? Elsewhere this week, Studio Canal announced Terminator 2 is coming to 4K Blu-ray with a special endoskeleton edition, LG stepped up its investment in OLED screen technology and Apple killed off the iPod Nano and Shuffle. There were also reviews of LG's OLED55C7V OLED TV, YG Acoustics' Carmel 2 floorstanders and Bryston's BCD-3 CD player. Sky has teamed up with Devialet to create a new soundbar. Called the Sky Soundbox, it's aimed at Sky users and is well-specced with Bluetooth connectivity, plus digital optical and HDMI inputs. Despite Sky's commitment to Dolby Atmos, it appears as though the Soundbox won't support it. It's available for order on the Sky website for £800, but Sky subscribers can get it for £300 and Sky Q customers for £250. If you bought the 4K release of James Cameron's Terminator 2: Judgment Day, you would have secured yourself a life-size replica of endoskeleton arm. We're talking in the past tense because it looks to be sold out on both Amazon and Zavvi, unless you want to try your luck on eBay. For those who just want the film, there's also a standard 4K version on its way, which we've found for £20 on Amazon. LG has doubled its investment in OLED as it continues to make a push with the technology. LG develops its own OLED screens and is looking to shift smartphone displays to the screen technology too. The Korean company is also developing flexible OLED screens, most likely for advertising. "LG says this C7 performs exactly like the B7, and we agree"
The C7 is much the same as its B7 stablemate, save for a different pedestal and exclusivity to Currys. Otherwise, this is very much the same quality set. Which is a good, as the B7 is fantastic. The OLED image is bright and natural looking and another feather in its bow is support for all HDR formats. "They require plenty of pampering before they shine"
Take care partnering the Carmel 2s and you'll be rewarded with a talented performer. Exceptional in terms of detail resolution and insight, the YGs generate a superbly focused, wide soundstage and the build and finish are fantastic. The price means they aren't for everyone and they struggle a little at low volumes. But when you have a speaker this good, why not go loud? "It is certainly worth a place on the shortlist if you’re after a higher-end CD player"
If you're not a fan of the digital revolution then Bryston has you covered. The Bryston is simply just a CD player, but one that renders music in a neat, detailed and even handed-way. It won't produce sonic fireworks, but it's balanced, neutral delivery ensures it can fit into a number of systems and let the music take centre-stage.